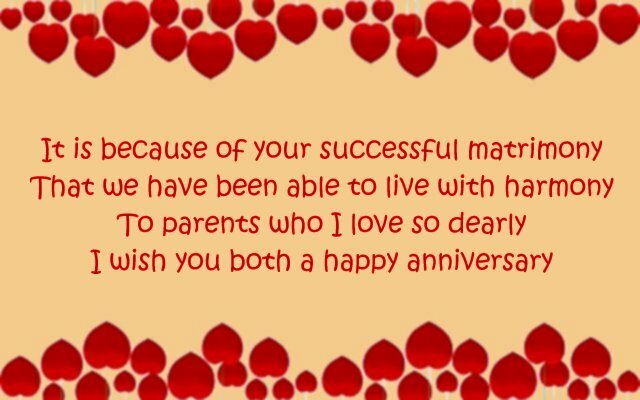 Anniversary wishes for parents: You mom and dad’s anniversary is not just about their wedding and their married lives. It is a celebration of how their love, not only for each other, but also for their children and their families has grown over the years. As husband-wife and as your parents, they both deserve beautiful greetings that are worthy of all the commitment and hard work they have put into their marriage. From funny family memories to romantic quotes – write the cutest and sweetest things on a card to make sure that your wishes are the perfect start to your parents’ special day. 1) I know you fight, but never in front of me. I know you argue, but not in a way that your kids can see. I know you have your differences, but you keep them private. I know you have problems, but you don’t let them affect your fate. To my parents whose commitment and love is so true, I wish a happy anniversary to both of you. 2) You are the parents that all kids hope to have, you are the couple that all lovers hope to be and you both are the pillars of support that every family wishes it had. Happy anniversary to the best parents ever. 3) Your togetherness in good and bad times has taught us teamwork. Your tolerance for each other’s habits has taught us patience. Your support during each other’s crises has taught us solidarity. Your lives as our parents have taught us how to live. Happy anniversary. 4) Happy anniversary to the couple who personifies love, exemplifies virtue, epitomizes perfection, characterizes righteousness and symbolizes the best in life. 5) You have always taught us to attain milestones in life. Congratulations on attaining one yourself. Happy anniversary to our dear parents. 6) A lovely daughter, a wonderful son, a beautiful house, two enviable careers and an awesome family – life seems to have given you both the perfect anniversary gift. Happy anniversary. 7) Happy anniversary to parents whose marriage mantra is – troubles will come and go, but be rock solid so that the kids never come to know. 8) Your anniversary day is our Thanksgiving Day – to thank you for getting married, giving us birth and being the amazing parents that you are. Happy anniversary. 9) I always thought nothing could be as flawless and perfect as my life. Turns out, your marriage is. Happy anniversary. 10) I admire you both not just because you are my parents but because you both are a living example of how two people can align their life goals, be committed to their love and nurture a family’s growth year after year. Happy anniversary. 11) How do I define my parents’ married lives? Sweet, cute, perfect and the most beautiful thing I have ever seen. Happy anniversary. 12) I will never understand why couples fight, I will never know why couples separate. Because my mom and dad aren’t just lovers, they are each others’ best mates. Happy anniversary. 13) This is not the time to look back on the good days of your life. This is the time to look ahead to the best days of your life that are yet to come. Happy birthday. 14) The biggest gift for you after your marriage was my birth. The biggest gift for me after my birth was parents like you. Happy anniversary. 15) We, your children, are the reason why you have a happy family. But you, our parents, are the reason why we have a happy life. Happy anniversary to you both. 16) With every passing year, your marriage isn’t becoming dull, old and thankless. It’s becoming beautifully vintage and exquisitely priceless. Happy anniversary. 17) Some kids in my class want wealth, some want success and others want fame. But I want to have a life like yours when I grow up. Happy anniversary. 18) It is a pity that you won’t be able to have a special anniversary. That’s because each day in your life is special anyway. Happy anniversary mom and dad. 19) Your first wedding anniversary must have been really romantic. Your second anniversary must have been really beautiful. But this anniversary will be special because we are celebrating it together. Happy anniversary mom and dad. 20) Thanks for putting so much pressure on me by raising the bar for a good marriage so high. Happy anniversary mom and dad. 21) Your reason for celebrating your anniversary may be love. But my reason for celebrating your anniversary is that you both are like a blessing from the Gods above. Happy anniversary mom and dad. 22) Happy anniversary to the couple who does everything in their power to make our happiness double. 23) Your anniversary has made me realize that a movie is not the only place where lover get married, have kids, make a loving family and live a perfect life. Happy anniversary. 24) The institution of your marriage has taught us core values of life, which no other institution in the world can teach. Happy anniversary mom and dad. 25) Every single day of the year revolves around what we want to do and where we want to go out to. Today is that day of the year when everything will rightfully revolve around you. Happy anniversary mom and dad. 26) Years will pass by and one anniversary will arrive after the other, but your love for each other will always be forever. Happy anniversary. 27) Most kids take a lot of time to figure out what they want their futures to look like. But I have known from the very start what I want my future to look like – exactly like your present. Happy anniversary mom and dad. 28) Graduation, birthday or first job – no celebration of my life would have been worthy if not for your anniversary which makes our family stronger with each passing year. Happy anniversary. 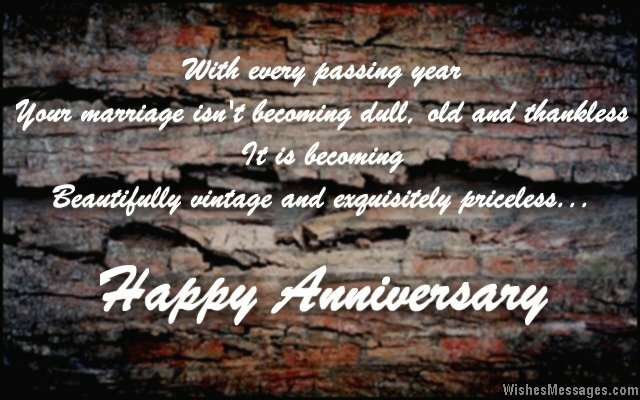 29) May the biggest of challenges in your life be limited to making every anniversary better than the previous one. Happy anniversary to you both. 30) I always thought that phrases like ‘once upon a time’ and ‘happily ever after’ only existed in fairy tales. But your marriage made me realize that they exist in real life too. Happy anniversary. 31) It is because of your successful matrimony, that we have been able to live with so much harmony. 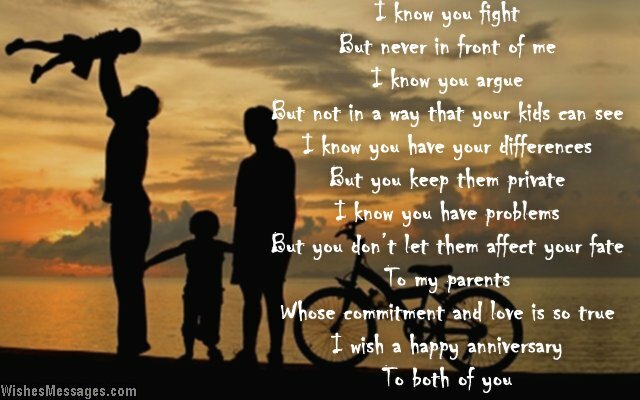 To parents who I love so dearly, I wish you both a happy anniversary. 32) This is not just the anniversary of your marriage, but the anniversary of all the hopes, dreams and ambitions you nurtured together. Happy anniversary. 33) You will never be able to renew your wedding vows, because you both have not let them expire in the first place. Happy anniversary mom and dad. 34) Regardless of what I study in college, I have already got graduation level lessons in true love, commitment and trust – thanks to a rock solid set of parents like you. Happy anniversary. 35) Earthquakes, tornadoes, tsunamis or volcanoes – nothing has the power to shatter, the love between my mom and dad. Not now, not ever. Happy anniversary.